Twenty-five handlers along with thirty-three dogs helped kick off this year’s training season with the joint GSPCI-VCOI Introduction to Field Trialing training day. 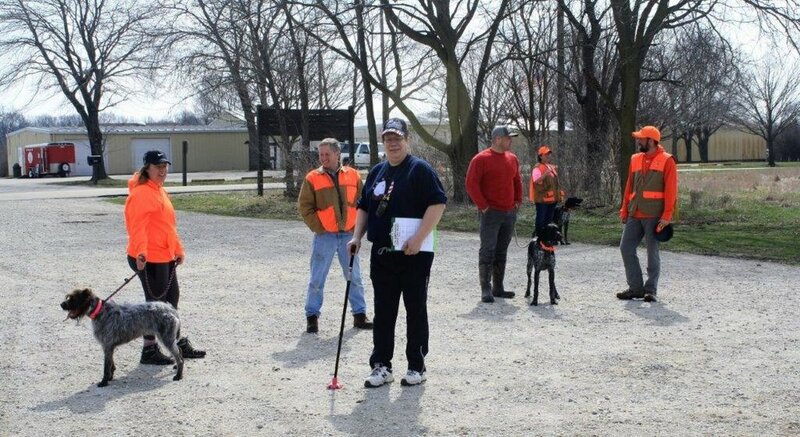 Organized by Dave Wolfe and Dennis Nowak, the two recruited experienced judges and handlers, Harold Heather, Chad Morsch and GSPCI’s Joe Vicari to help introduce a group of eager handlers to the fun of field trialing. The morning began with a classroom style discussion led by Dennis Nowak and Dave Wolfe featuring veteran handler and breeder, Joe Vicari. The first group of handlers then headed out to the field with the younger, Puppy and Derby age dogs being judged and coached by Dennis Nowak and Randi O’Neill. Saddled up and dressed for a winter ride, Harold Heather and Chad Morsch began what turned out to be a long, long day in the saddle. With nothing to break the late winter wind the two dedicated sportsmen patiently guided the rest of the handlers through various levels of hunting/gun dog stakes. After a quick break for lunch, we finished up the afternoon with a group of cold, but happy handlers and dogs. For most of the participants this was their first exposure to field trials. Most of the questions related to the similarities and differences between this and the more familiar hunting tests. We hope that the day will encourage more of our members to give the original pointing dog field sport a try. Helping to make the day a success were additional volunteers, Patti Nowak, Brad Haseman, Andy Caron, Kevin Henthorn, Brad Lepoudre and Perry Dlugie. Fifteen entries of one-man-one dog and two-man-one dog teams braved high winds and late winter temperatures to enter our fourth annual Top Gun Competition. While the event is billed as a competition, all the handlers are in it for the fun and camaraderie. Event organizers Frank Susi, Dave Wolfe and Chuck Horvath again called upon the youth of our club; recruiting Nathan Selep to judge the two-man and Matthew Dlugie to judge the one-man divisions. The young men held up admirably under the winter conditions giving our entrants a fair shake while the rest of us huddled in the warmth of the check station. Rounding out the rest of the field were Dakota – Connie Susi and Frank Susi, Maggie – Tony Mattingly and Phil Truty, Jazz – Frank Susi and Connie Susi, Levi – Kate Keenan and George Noffs and Seamus – Patrick Parker and Andy Caron. Rounding out the rest of the field were Rosie – Andy Caron, Belle – Mike Smith and Reese – Chuck Thomas. While the morning may have been a bit chilly, the fields were dry and birds were quick. Many of us found the combination of the small quail and high winds quite a challenge after a fall of pheasant hunting. All the rounds were completed and our participants (and judges) were in the check station warming up over pizza and excuses well before the afternoon rain began. Thanks also to Randi O’Neill, John DiMonte, Christian Messmacher, Andy Caron, Ivan Bivolarov and Perry Dlugie for their help with the event. With the darkest stretch of winter weather upon us now is no time to ignore your canine companion. While short days, snowy fields and cold weather may not seem like the ideal time for dog activities, there are a multitude of activities that you can be doing now to keep your pup on his game and prepare for the spring and summer training/competition season to come. Need some work with retrieving? It’s easy to carve out one or two fifteen minute sessions a day to go through the steps of the trained retrieve. You also won’t have the temptation or distraction of bird work which is generally not recommended while going through the training. While each dog is different, most trainers figure on allowing four to eight weeks to go through the entire process. A quiet spot in the back yard, porch, basement, family room or even the garage is all the space you’ll need for a training table or even just a five-gallon bucket to sit on while working with your dog. Check out Evan Graham's Smart Fetch or others from a complete selection of training DVDs at Gundogsupply.com. Is there such a thing as a hunting dog that doesn’t need a little more work on basic obedience? Bundle up, grab a Huntsmith Command Lead or leash and take your buddy for some short walks around the neighborhood. Besides working on heeling, you can drop the lead to work on whoa, or bring a bumper and work on hold or fetch. Use a check cord to work on recall and quartering. Find a quiet corner in the house and work on down, hold or even sit. Reinforce the training with an e-collar. Work on using the collar as a cue, not just a correction, by using light stimulation. Have some fun in the field even if it’s covered in snow. Instead of a bumper, use a Dokken or a cloth Frisbee type flying toy that won’t sink into the snow. Just be careful not to overdo it if the snow is too deep or if the temperatures are in the single digits. Load up your pup and take a field trip to the local dog supply store. Use the other dogs and shoppers as distractions to work on socialization as well as obedience. You might even treat your buddy to a new collar or a dog treat while you’re there. Hopefully these ideas will show you that you don’t have to ignore your best hunting partner just because it’s cold outside. To learn more about these techniques, join us this spring at our Foundations of Field Training sessions. Thank you to everyone who helped to make our Fall Hunting Tests a success. Once again, we had a great turnout of GSPCI volunteers for the weekend. We apologize if anyone was inadvertently left out of this report. What a difference five months makes. Our spring hunting tests saw some of coldest weather in recent memory, with our crew having to begin each morning by breaking the layer of ice that formed overnight in the water troughs. In contrast to the spring, our fall tests were some of the warmest, with temps flirting with 90 degrees each day. Fortunately, our team of GSPCI volunteers were once again up to the challenge. As planning began a few weeks ahead of the tests Trailer Wrangler and Course Designer, Chuck Horvath worked with the Des Plaines grounds crew to ensure that our field and back course were in top shape after an unusually active summer growing season. Having cleared the background check for entry to the “cone of silence,” the draw was completed with the help of Matthew Dlugie. After Chuck Horvath dropped off the trailer, work began in earnest on Friday afternoon with new Test Chairman and board member Dave Wolfe and Perry Dlugie setting up the field. The Saturday and Sunday morning set up team of Hunting Test Director Frank Susi and Dave Wolfe were welcomed by mild fog and a crew of GSPCI members eager to get to work in the field, parking lot and control desk. With the pool of qualified judges growing smaller each year we were fortunate to be able to recruit such respected canine connoisseurs as Saturday’s team of Joe Delaney of Minooka and Joel Peterson of Kenosha and Sunday’s dynamic duo of John Morrison of Sugar Grove and Rick Torres of Burlington. Our judges did a great job meeting the AKC requirements for judgement while addressing concerns for the dogs’ well-being in the extreme heat. The GSPCI hunting tests field crew continues to be the envy of every club in the area, and the gunners’ tent is the place to be for a front row seat to view the dogs and handlers in action. As is the case at all of our tests, the tent was buzzing with activity all weekend. Steve Odell was back in his favorite role as Senior Avian Placement Specialist, wearing out the boot leather and setting an example for the new APS on how to manage the field. Joining Steve in the coveted role of APS were Hans Hansen, Chris Cozzi, George Noffs, John Soehn, Tracy and Chris Lewis and Frank Susi. Adding Captain of Guns to his role of Hunting Tests Director, Frank Susi put together a top-notch team of marksmen to handle the gunning duties for the weekend. Frank’s Avian Artillery Specialists were Nathan Selep, John Morrison, Dave June, Chuck Graack, Andy Caron and Hank Freitag. While the dogs covered the field in search of birds, GSPCI’s Queen of the Parking Lot, Merri Odell covered the parking lot in search of the next handler to send to the line. Merri is a legend when it comes to keeping everyone on their toes and to the line in time. Teaming up with Merri was long time Line Marshal, Steve Selep, assisted this year by GSPCI’s Most Improved Handler of the Year, Christine Selep. Andy Caron was there to assist by taking handlers on a guided tour of the field and running scores to the desk. Greeting the handlers, taking scores and handing out ribbons may seem glamorous, but it can be hard work. Board member, Rich Gilloffo, recruited and trained his own crew to help on Saturday. Joining Rich were Zoraida June, Kate Keenan and Tracy Lewis. Keeping them company in his role as Mr. Hospitality was long time GSPCI member and raconteur extraordinaire, Paul Kosowski. Desk duties on Sunday were handled with grace and wonderfully legible handwriting by Karen Torres. Taking his cue from test Secretary, Perry Dlugie Club Secretary Elect, John Singh was on the grounds; but it was difficult to determine what if anything he or Perry did all weekend. 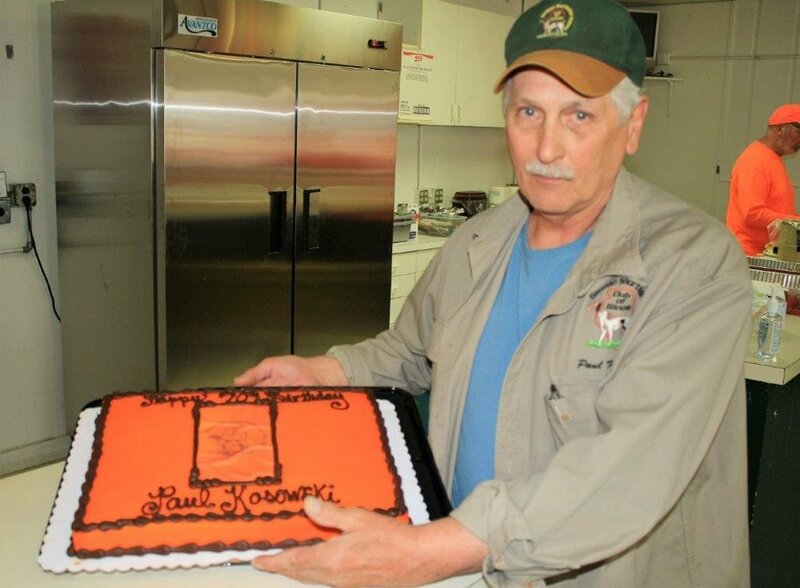 With a new concessionaire not yet in place, Al Haseman once again stepped up to make sure that everyone was provided with a tasty lunch for the weekend. Ably assisted by brother Brad, Zoraida June and chef/treasurer in training, grandson Jacob, Al made sure that everyone was well fed and ready for the afternoon’s braces. As is the GSPCI tradition, Saturday night’s cook out was well attended and well stocked with food. Once again assisted by brother Brad, club Treasurer and Master of the Grill, Al Haseman put out a heapin’ helpn’ of grilled chicken, pork chops and fixin’s that more that satisfied even the hungriest of handlers. Helping to make sure the evening ran smoothly were Scott Ludwig, Patti Nowak, Alice Graack, Sam Phillippe and Karen and Geno Lambeth. Al’s grilling was beautifully complimented by a counter full of side dishes and desserts generously provided by many of the folks staying for dinner (thank you to everyone who brought a dish to share). As always, no one walked away hungry! The evening concluded with social hour(s) around the campfire in the parking lot’s RV city. The heat continued Sunday, but our crew kept their focus and we were out of the field by early afternoon. A flurry of activity in cleaning and packing followed with Frank Susi, Al Haseman, and Dave Wolfe leading the charge, hauling equipment in from the field and making sure everything was ready to be put in its proper place in the trailer. Paul Kosowski proved that he hasn’t lost his touch with a broom, rekindling his former role as test chairman, staying late to sweep out the building to put an official end to the weekend. We sincerely thank all the handlers, volunteers and friends who stopped by to enjoy the weekend. We also thank Purina Pro Plan and Terry Trzcinski for handler’s gifts and continued support of our club. We take great pride in putting on the best tests that we can and thank all of you who help to make that possible. We look forward to seeing you at the 2019 spring tests on April 6 and 7. In the meantime, be sure to check the club website at Fall Hunting Test Photos for pictures from the tests and updates on upcoming events. The dog days of summer arrived in full force for our annual Mock Hunt Test with VCOI. Although the temperatures crept into the 90’s, our handlers and volunteers were prepared, and we were able to get through the day without any dogs (or handlers) having any problems due to the heat. Once again, we had a great turnout with nineteen handlers and twenty-seven entries. The dogs were judged by long-time GSPCI member and AKC judge, Ed Brock along with relative newcomer, Bill Jones. Ed was generous enough to bring along his horses, so the younger dogs were able to get an introduction to our equine friends. Bill pushed the limits of his youth, walking every brace, then taking to the field afterward for some training time with his own dogs. If you did not get a chance to see your scores, email me an I’ll see if I have your card. Note: the judges did not score the hunting category for anyone due to the abbreviated size of the course. The success of club events like this is due to all the members who not only participate, but who also pitch in to help both before and throughout the day. We’d like to give credit to those of you who helped out on Saturday; we apologize if anyone’s name was inadvertently left out. Like most of our events, the day begins and ends with Dave Wolfe, who is always willing to set up and take down the fields. Bird planting duties were handled by Christine Selep and her great-niece, Keyle, along with George Noffs, and Ivan Bivolarov. Our gunners were John Morrison, Hank Freitag and Chuck Graack. A key to our Mock Hunt Test is having experienced handlers available to help the novices. Andy Caron and Bill Padovano did a great job as coaches. While keeping the handlers updated and ready to rock is always important, given the day’s heat, line marshal, Rich Gilloffo was particularly outstanding in keeping the day moving along. Perry Dlugie did his best to look busy but as is always the case, fooled no one. As is the custom for the Mock Hunt Tests, lunch was orchestrated by Dennis Nowak. The delicious star performer were pork chops that were complimented by a variety of supporting side dishes provided by our handlers. Assisting Dennis in preparing lunch were Patty Nowak and Alice Graack. The lunch break was particularly appreciated as everyone took time to visit and cool off in the air-conditioning. We look forward to seeing everyone at the fall hunting tests beginning next month. Check all of the club websites for event dates and premiums. Twenty-one handlers enjoyed a beautiful spring day while learning how to better communicate with their dogs. Co-hosted by GSPCI and VCOI, our third Hay Creek Kennel Training Clinic was attended by a mix of new and experienced handlers. Hay Creek Kennel’s, Sonny Piekarz did an outstanding job addressing the needs and questions of both our brand new and repeat seminar attendees. Sonny trains, guides and presents seminars with Rick and Ronnie Smith of Huntsmith fame. With over eighteen years of training experience, Sonny shared his understanding of the foundations of how to open our dog’s minds to learning. With our club’s training program being based on the Huntsmith method, the workshop was a great way for the handlers to learn first-hand the fundamentals of the system and tools used. What do twenty minutes, four quail and a stopwatch add up to? A morning’s worth of fun for the handlers in this year’s Top Gun Competition. Congratulations to committee members, Dave Wolfe, Frank Susi and Chuck Horvath for continuing to do a great job building Top Gun into one of our club’s favorite events. Twenty-six dogs were entered between the single-handler and two-man teams. While billed as a competition, Top Gun is a fun event for dogs and handlers of all levels. We were excited to see so many new entries this year. We thank Al Haseman with help from buddy, Ed for grilling up lunch for everyone. Pitching in to help out with marshaling, bird planting and whatever else was needed to keep the day running smoothly were Andy Caron, Rich Gilloffo, John Dimonte, Ivan Bivolarov, Marty Kyes and Tony Mattingly. We thank everyone for their help in making the day such a success and look forward to next year’s event.